We are the leading Manufacture & exporters Majority of polyuretane foams exhibit poor stability to light as they turn pale when exposed to sunlight. This yellow foam is caused due to oxidation which is caused by combined action of oxygen and light, especially the UV light. We offer UV stable white polyurethane foam and PU foam for innerwear obtained by treating it with special additives. These hard PU foam shows high stability against sunlight. 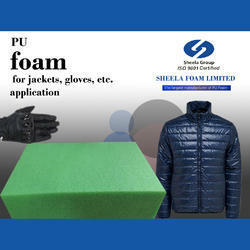 Our entire range of foam can be treated and turned into UV stable foams on the demand of our client. 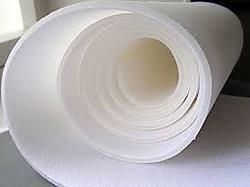 Under the category of UV stable white foam we offer several products as given below. Evaluating Resistance : To Light: Weatherperson is used to evaluate the resistance towards the light. This resistance is expressed in terms of the number of hours of exposure to the Xenon lamp. Our UV stable foam exhibit high blue scale index and thermal stability. We are the leading Manufacture & exporters Foam For Clothing Majority of Polyurethane foams suffer from poor stability towards sunlight. When ex Majority of Polyurethane foams suffer from poor stability towards sunlight. When exposed to sunlight these foams turn pale. So, we offer additive treated foams which show high stability to sunlight and hence are excessively used in foam for clothing. The resistance to light can be evaluated using a Weatherometer and is expressed in terms of the number of hours of exposure to Xenon lamp, a source of UV light. More the number of hours, higer will be the stability towards sunlight. The foam offered by us scores highly on the blue scale index from 1 to 8. UV stability plays a very important role,where paling (yellowing) is detrimental to the product quality ,outlook and life. Paling is natural process caused due to oxidation which is a result of combined action of oxygen and light ,especially UV light .This foam has no carbon or any other auxiliary blowing agents .This makes the foam usable in various kinds of undergarments,without harming the human body .This speciality foam provides superior thermo-formability and color stability .It has a high stability to light ,obtained by means of special additives .It is environment friendly and meets ROHS and REACH standards. The most critical aspects of UV stable foam are Hydrolysis Test ans Sun Test ( Color Fading).Resistance to light is evaluated on a weatherometer and is expressed in terms of number of hours of exposure under xenon lamp that is considered necessary to reach a certain degradation or color fading and is measured on Grey Scale Index of 1 to 5 depending upon the products and customer requirements. Paling is natural process caused due to oxidation which is a result of combined action of oxygen and light ,especially UV light .This foam has no chloroform carbon or any other auxiliary blowing agents .This makes the foam usable in various kinds of undergarments,without harming the human body .This speciality foam provides superior thermo-formability and color stability .It has a high stability to light ,obtained by means of special additives .It is environment friendly and meets ROHS and REACH standards. UV stability plays very important role,where paling (yellowing) is detrimental to the product quality ,outlook and life.